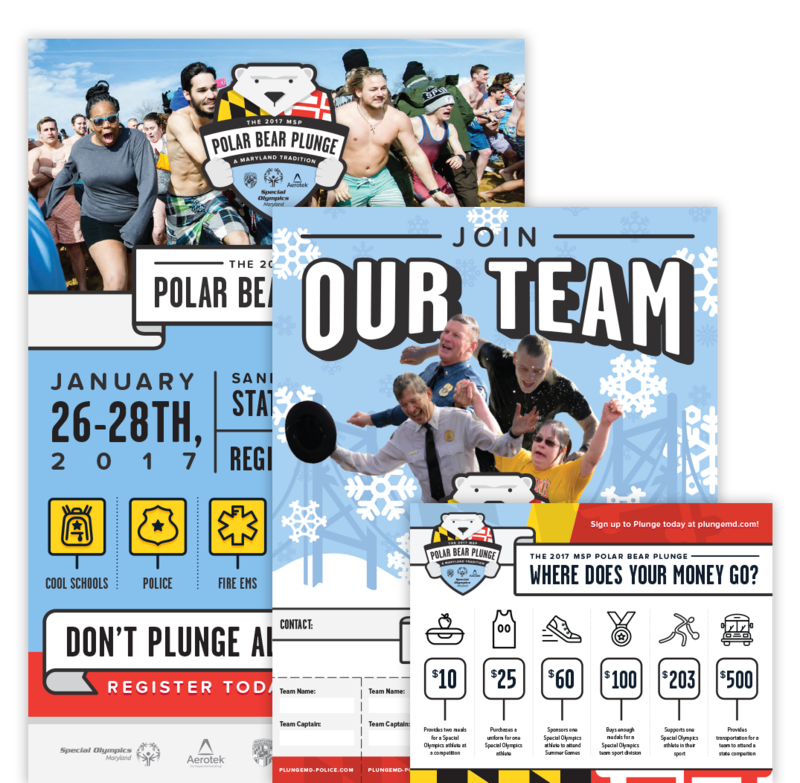 For the 20th anniversary of the MSP Polar Bear Plunge, Zest successfully tackled a full rebranding of the event, dubbing it "A Maryland Tradition." Through the efforts of both teams, Sandy Point State Park saw more than 9,000 Plungers in 2017, and together over $2.5 million was raised to support the athletes who participate in Special Olympics Maryland. In addition to the Polar Bear Plunge, Zest works with Special Olympics Maryland annually on events including the Deep Creek Dunk, Summer & Winter Games, Maryland Rockfish Open and Fort McHenry Tunnel Run. We partnered with the Special Olympics of Maryland because we were awestruck and inspired by their work. Zest has donated more than $80,000 of in-kind services to supporting their mission, working to provide digital and creative support to make the message reach further and more effectively. Our work started at the foundation for the brand- the logo. In an effort to balance the old and the new, the 2015 Polar Bear Plunge logo was revamped in 2017. The current logo to includes traditional aspects of the plunge brand, while incorporating the tag, "A Maryland Tradition." The Creative Guru's at Zest also felt it was important to provide recognition for Plunge's key sponsors: Maryland State Police, Aerotek, and Special Olympics Maryland. To further promotion, a variety of logos were created to represent the various Plunge Properties including Police, Cool Schools, Military, Fire/EMS, Pee Wee & Family, and Corporate. 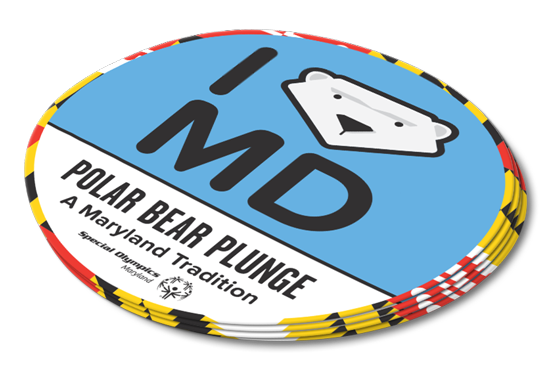 Lead-up events to the Plunge received their own personal logos as well: Thrills & Chills, University Plunges for Maryland, Towson, and St. Mary's, and Ravens Plunge Training. Icons were developed to provide a visual representation of each Plunge property, and accentuate digital and print marketing. From left to right, they are: Cool Schools, Police, Fire/EMS, Military, Corporate, and Pee Wee & Family. 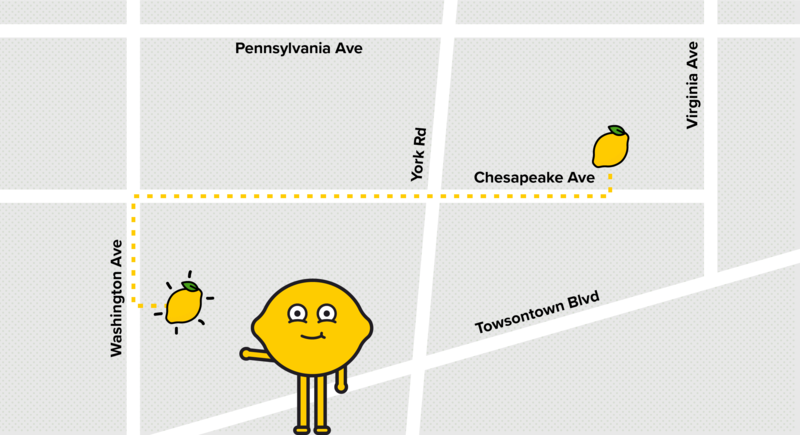 Zest worked to reinvent SOMD's social interface, creating content and establishing consistency and impact in branding. We worked to keep things lively and fresh throughout the duration of the campaign, constantly working to use variations of profile pictures, cover images and other forms of notification driving updates to keep SOMD and sponsors front of mind for our audiences. 3 generic Plunge Snapfilters were created to run each day of the event. Filters specific to each Plunge Property were created to run during the event in order to give Plungers the opportunity to create their own Plunge narrative through their customizable snap story. 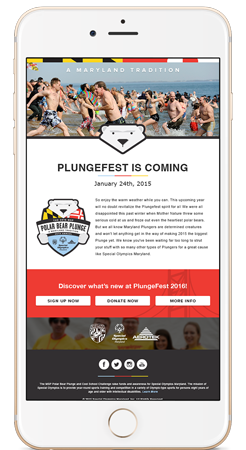 Digital newsletter assets were created to promote Plunge via email leading up to the event. Such campaigns featured quick links for a user to register for Plunge, and donate to a Plungers fundraising campaign. Email marketing campaigns were implemented in 2016, and used for promotion in 2016 & 2017. 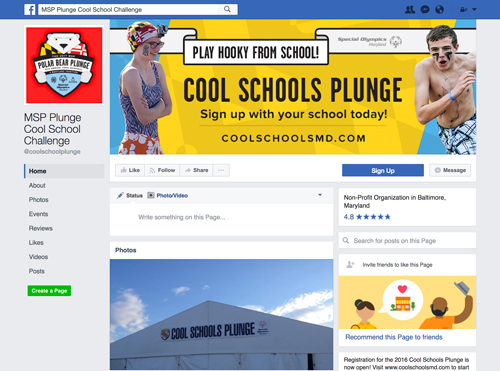 Zest worked with SOMD to create a yearlong Facebook and Instagram campaign to promote Plunge - which took SOMD to social media in full force for the first time. 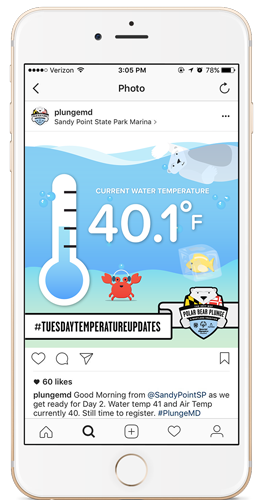 Tuesday's were dubbed #TuesdayTemperatureUpdates and the falling temperature of the Chesapeake Bay water was featured for each Plunger leading up to the event. A chilly reminder of a great cause right on your Facebook timeline every Tuesday! 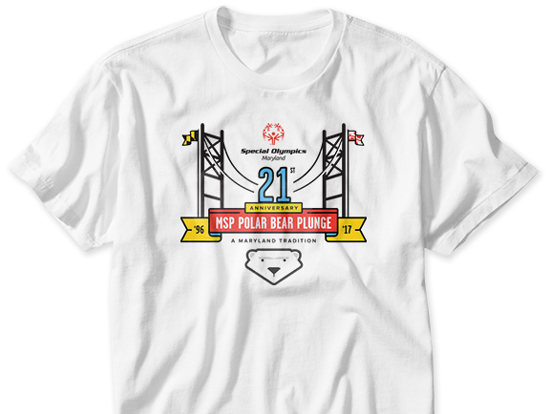 The t-shirt design for the MSP Polar Bear Plunge accentuates the "Maryland Tradition" theme, through the incorporation of the Bay Bridge graphic (used throughout print and digital marketing assets) and the dual flags featuring patterns found on the iconic Maryland flag. 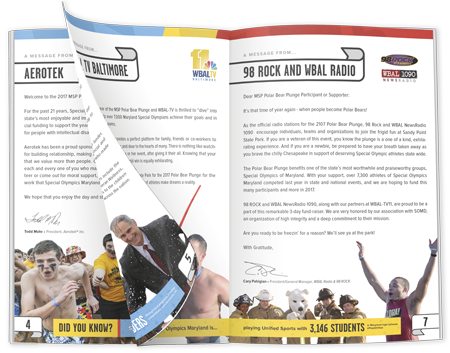 A 5.5 x 8.5 half fold program booklet was created for Plungers and distributed at Sandy Point State Park each day of Plungefest. The program contains letters from sponsors and media partners, Plunger spotlights, athlete bios, and event information. Letter, legal and oversized posters were created to promote the Plunge and Plunge Properties. 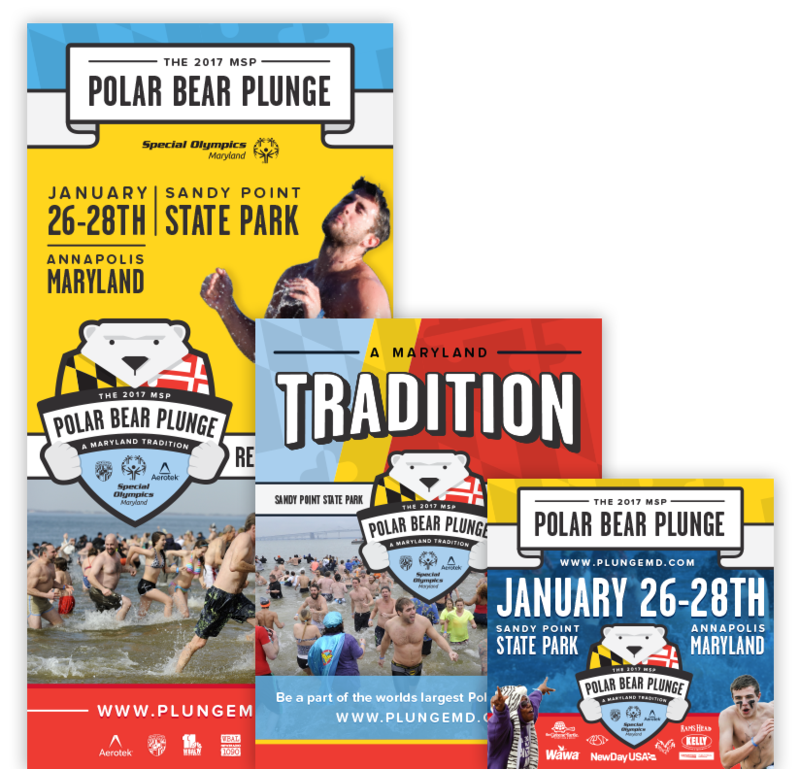 The posters were provided to companies, schools and police departments to promote the Polar Bear Plunge within their own facilities. Posters with sponsorship & fundraising were created to update Plungers as to the use of the money raised during the 2017 campaign. Rip-Off posters were developed in addition to the others to encourage team registration. Numerous ads were created for print and digital publication in outlets including the Baltimore Business Journal, SOMD Event Programs, Capital Gazette, Press Box, Severna Park Voice and What's Up Magazine. Multiple sticker designs were created for the 2017 Polar Bear Plunge including a circle and rectangle shaped sticker. These stickers were then sold at Plungefest in the merchandise tent along with many other Plunge themed items. The rectangle shaped sticker featured the words, "Don't Flake!" a reoccurring theme in 2017 Plunge promo materials. 2017 was the first year that Chick-fil-A and Special Olympics Maryland teamed up with Zest to create in store displays for Chick-fil-A customers. In addition to the pop up banner, the in store display featured the Plunge Postcard, donation box, and general Plunge materials. 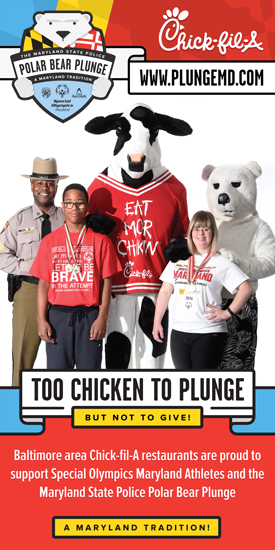 In store Plunge displays were featured in most of Chick-fil-A's store locations in Baltimore County & City. 2017 was also the first year Zest created animations for the Polar Bear Plunge. A full bear illustration was created to use in each animation. Our "Plunge Across Maryland" animation ad featured location targeted counties around Maryland. Digital Billboard displays were created and located along I-95, I-83, and Route 50 to promote the 2016 & 2017 Polar Bear Plunges. All designs leading up to the event were general Plunge promotion advertisements and included sponsor logos. The "Did You Know?" video created for the 2017 Plunge probably showed up on your Facebook timeline in the months leading up to the 21st Annual Polar Bear Plunge. "We have worked with some really great designers in the past and some solid companies but the thing I really am growing to love about Zest is they are a true extension of our team. They have a great creative team but equally is important they are collaborative, responsive and help us achieve our goals."